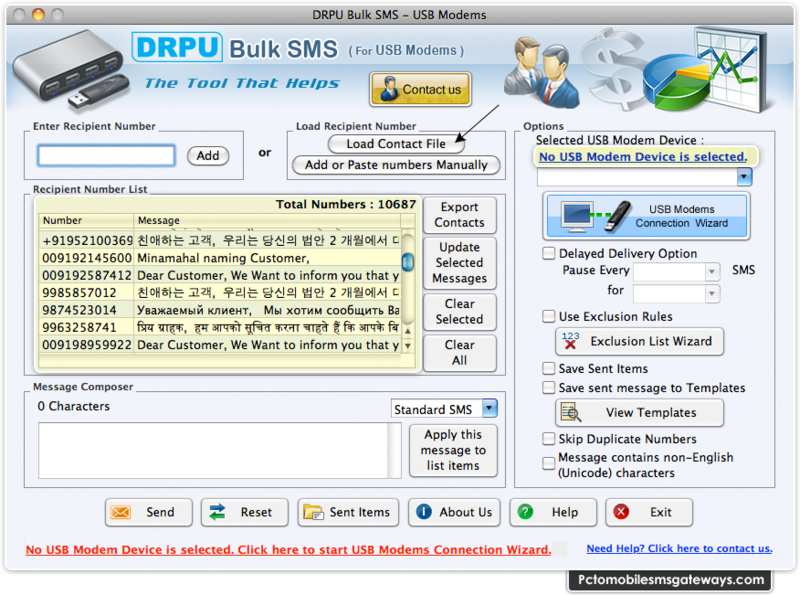 PC to Mobile Mac Bulk SMS Software for USB Modem helps you to send unlimited text messages from apple Mac computer using USB modems. Macintosh SMS messaging programs can delivers alerts, events, notifications, standard messages, share market updates and other personal text messages in few easy steps. PC to mobile SMS gateways application for MAC OS X provides delayed delivery option to control and customized load of bulk SMS broadcasting. Now you can easily communicate with your national or global mobile customers by sending bulk text messages from your MAC computer using USB modems. Forwards thousand of text messages instantly across the world. Skip duplicate contact number during bulk SMS sending procedure. Provide exclusion list wizard option to maintain list of contacts or groups. Saves sent text SMS details to templates. No internet connection is require to send bulk SMS.